Despite concerns that the Affordable Care Act’s reforms would undermine employer –sponsored health insurance, a recent study by the Kaiser Family Foundation finds that employer coverage remains steady and premiums have increased only modestly. While this is welcome news, long-term trends that show decreasing employer coverage – and increasing costs for those that are covered – highlight the need to strengthen all pillars of coverage, including Medicaid, CHIP, and the ACA’s state health insurance marketplaces and premium tax credits. The Kaiser study, based on the Employer Health Benefits Survey conducted with the Health Research and Educational Trust, finds that the 55 percent of firms that offer health coverage to their workers is statistically unchanged since last year (57 percent), while premiums have increased by three percent. Of course, even a relatively small increase of three percent can be a problem for families struggling to meet the cost of living as earnings have failed to keep up. But according to Kaiser’s survey, premiums have increased more slowly over the past five years (26 percent) than the five years prior to that period (34 percent). 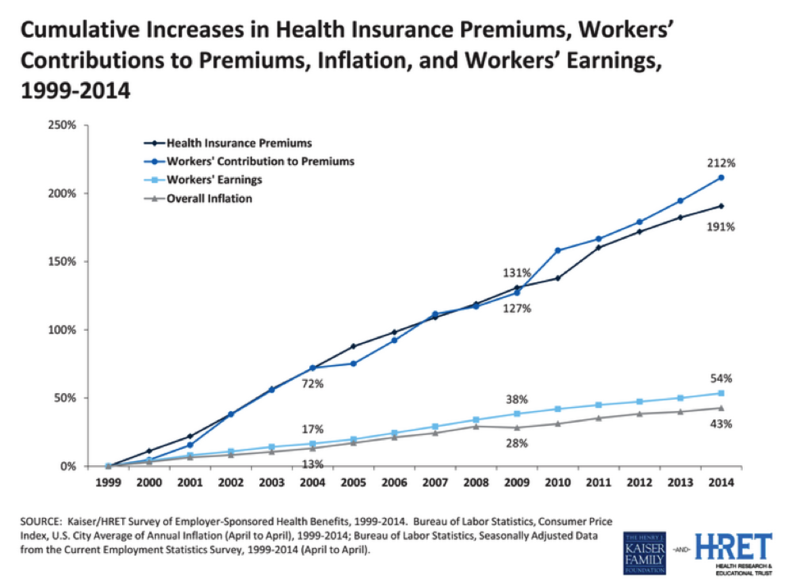 Over the longer term, workers’ share of premiums has increased by 212 percent since 1999. Kaiser’s survey also finds that workers are increasingly asked to take on the cost of their coverage in addition to of their monthly premiums. 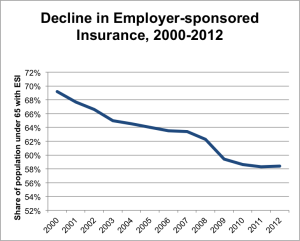 Since 2009, the average employee deductible has increased by 47 percent. This follows a growing trend in which employers are moving toward so-called “consumer-directed” plans that allow employers to cut costs while placing more of a burden on workers and their families. 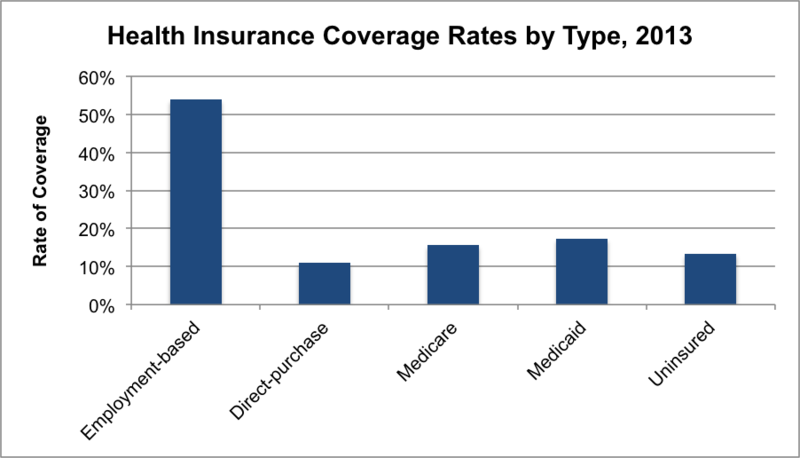 According to Kaiser’s study, 20 percent of workers were enrolled in high-deductible plans, up from 8 percent in 2009. Speaking broadly, 80 percent of all workers with coverage through their employer have to pay an annual deductible, with the average deductible of $1,217, an increase of 47 percent since 2009. 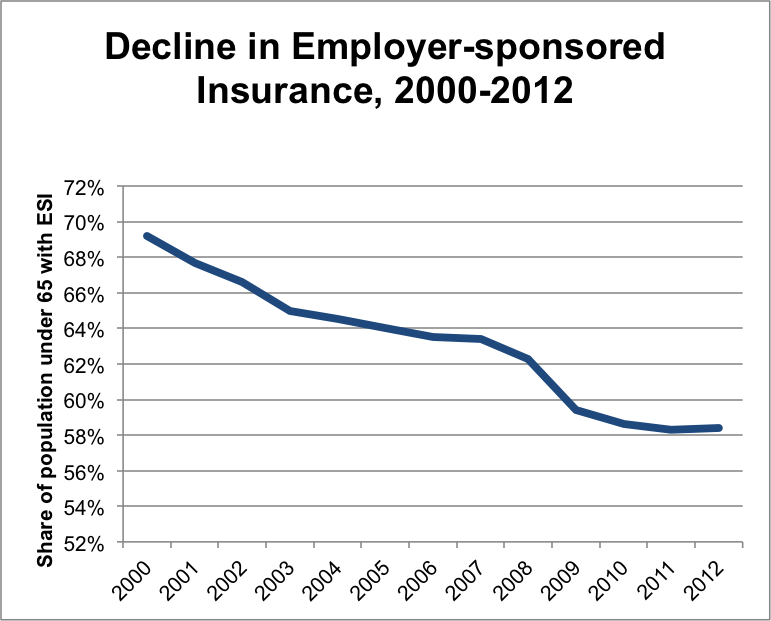 Many aspects of the ACA seek to strengthen employer-sponsored insurance as a source of coverage in the United States. Beginning next year, the ACA’s employer mandate will take effect, and employers at least 100 full-time equivalent workers will have to provide coverage to their workers or face a penalty. After 2016, the same requirement will apply to companies with at least 50 workers. In addition to these requirements, federal policy has long provided incentives for businesses to provide their workers with health coverage. The ACA provides tax credits to small businesses(less than 25 employees) to purchase coverage for their workers, while the longstanding exclusion of the cost of employer-provided health insurance from federal taxes provides an incentive for companies to cover their workers at great expense to the federal government. The ACA also strengthens the kind of coverage that employers offer their workers by requiring this coverage to meet certain requirements, including preventive benefits without cost sharing. According to the Kaiser study, there are now 26 percent of workers in ‘grandfathered’ plans that do not comply with the ACA’s new requirements, down from 36 percent last year and 48 percent two years ago. Kaiser’s finding that employer-sponsored insurance remains stable is important given it is the largest source of coverage for workers and their families. But not all families receive employer-sponsored insurance. While Kaiser’s study finds that 94 percent of employers with at least 100 workers already offer health benefits to their workers, only 52 percent of employers with 50 or fewer workers offer any kind of insurance. Further, although coverage remains stable following the first year of the full implementation of the ACA, over the longer term, employer coverage has steadily decreased. While the Kaiser survey’s finding about keeping employer-sponsored steady is important, the fact that many families cannot rely on insurance through their workplace makes the additional pillars of coverage such as state health insurance marketplaces, Medicaid, and the Children’s Health Insurance Program (CHIP) critically important as well. 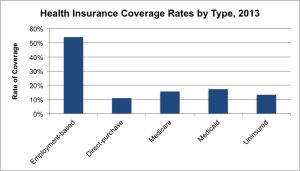 Just as the ACA seeks to strengthen employer coverage, it also provides additional avenues to obtain insurance through the law’s Medicaid expansion for low-income families and individuals and the creation of state marketplaces through which individuals and families can obtain insurance and possibly qualify for tax subsidies. These sources of coverage, along with CHIP, help fill in the gaps left by the system of employer coverage to ensure that all families are covered regardless of their employment or income status. Editor’s Note: Sean’s post was originally published on Georgetown University Center for Children and Families’ Say Ahhh! Blog. This entry was posted in Implementing the Affordable Care Act and tagged affordable care act, employer-sponsored coverage, employer-sponsored health insurance, high-deductible plans, preventive benefits by CHIR Faculty. Bookmark the permalink.